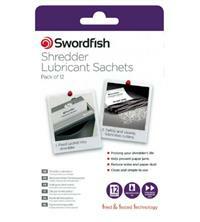 These Swordfish Shredder Lubricant Sachets (12 pack) are an ideal, fuss-free way to oil your machine. They work with any brand of shredder and are simply fed into the mouth of your machine, the same as you would do when shredding a sheet of paper. The encapsulated oil is specially formulated to evenly lubricate the cutting blades, helping to keep your shredder working optimally - and free from paper dust and clogging. Oiling your shredder can also reduce the level of noise it makes too. Consider using these lubrication oil sachets once a month, or every time the waste bin is emptied. Oiling your shredder helps prolong the life of your machine and improve its performance - and these Swordfish oil sheets are a really easy and convenient way of doing it.